Long-staple Egyptian cotton is the best in the world. The 50 weight is the finest of the Mako threads and is very smooth and strong. 100% mercerized cotton. 220 yard / 200-meter mini spool. Each spool of AURIfil Cotton Makó is mercerized - this enables fiber's contraction and increases the efficiency during the drying procedure. 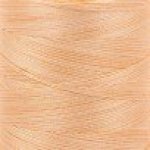 The result is a high sheen thread with a great washing resistance. 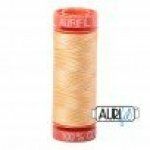 The ideal thread for quilting, sewing, and embroidery both by hand and machine. The finest of the cotton Makò threads. Quilters love it for piecing and quilting. It's fantastic for fine machine quilting stitch, excellent for machine appliqué and piecing, recommended for miniature patchwork projects, and very good for piecing and quilting in both top and bottom. Orange plastic thread holder.